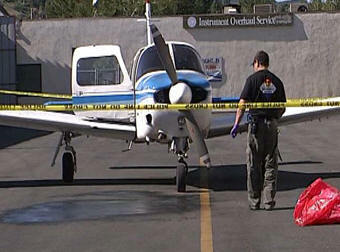 January 31, 2012 - Private pilot Gordon Woodard, 41, of Lakeside, California was killed Monday when he tried to manually restart his 1974 aircraft engine in a procedure known as hand-propping. At about 8:30 AM Gordon and a passenger who was also identified as a pilot were taxiing the Piper PA-28R-200 Cherokee Arrow II aircraft, registration N746R, out to the runway when the engine stopped running at Gillespie Airport (SEE), El Cajon, California. Gordon attempted to restart the engine but in his attempt the battery was drained. Gordon got out of the airplane and attempted to hand-prop the Lycoming IO-360 engine propeller. This is a procedure that must be acted upon with extreme caution. Hand-propping an engine requires the propeller to be swung by forcing the blade downward rapidly, pushing with the palms of both hands. Gordon got the aircraft engine started after being propped, Gordon was then struck in the head by the propeller knocking him to the ground and causing massive loss of blood. It is not clear if Gordon stepped away from the aircraft after he propped it or if the aircraft rolled into him. Gordon seriously injured, was taken by ambulance to Sharp Memorial Hospital were he died from his injury. There are no FAA regulations that ban pilots from hand propping an aircraft engine and nor would it be viewed as careless and or reckless behavior. However, Due to the associated hazards, this method of starting an aircraft engine is only done when it absolutely necessary and when proper precautions have been taken. Tom Hannawa, owner of American Aviation Academy stated "my flight instructor saw an individual grab the blade with both hands and initiated a motion downward. When he did that, the engine apparently caught and the rising propeller coming up struck the individual on the top of the head." FAA training manuals state that an aircraft engine should not be hand propped unless two people, both familiar with the airplane and hand propping techniques, are available to perform the procedure. The person turning the propeller blades directs all activity and is in charge of the procedure. - Person out front says, ?GAS ON, SWITCH OFF, THROTTLE CLOSED, BRAKES SET.? - Pilot seat occupant, after making sure the fuel is ON, mixture is RICH, ignition/magneto switch is OFF, throttle is CLOSED, and brakes SET, says, ?GAS ON, SWITCH OFF, THROTTLE CLOSED, BRAKES SET.? - Person out front, after pulling the propeller through to prime the engine says, ?BRAKES AND CONTACT.? - Pilot seat occupant checks the brakes SET and turns the ignition switch ON, then says, ?BRAKES AND CONTACT.? When hand propping is necessary, the ground surface near the propeller should be stable and free of debris. Unless a firm footing is available, the aircraft should be relocated where there is no loose gravel, wet grass, mud, oil, ice, or snow that might cause the person turning the propeller to slip into the rotating blades as the engine starts. Gordon was married with children and Vice President and lead engineer for Southern California Soil and Testing Company in San Diego which provides consulting services in the areas of geotechnical engineering.